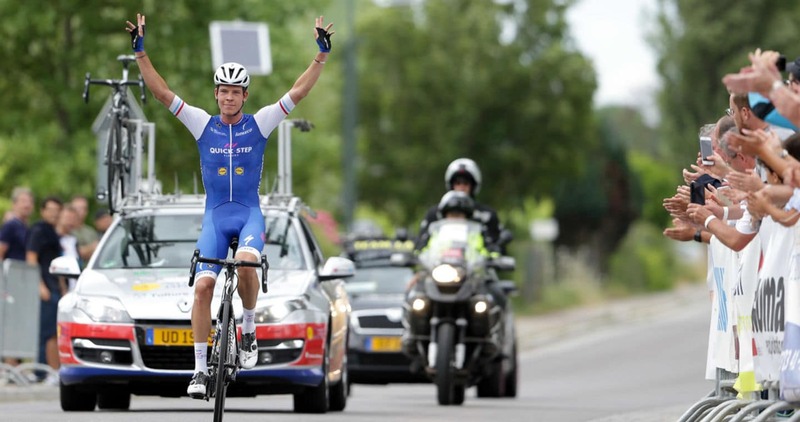 For the fourth time in his career, the Luxembourger won the National Road Race Championships. Bob Jungels was a man on a mission this Sunday, when he lined out at the start of the Luxembourg National Championships, which took place in Schengen, over a 19km-long circuit that included two climbs. The riders had eight laps to cover, and it was on the fourth one that the Giro d’Italia white jersey winner attacked and forged a considerable gap over Ben Gastauer (AG2R) and Alex Kirsch (WB Veranclassic Aqua Protect). The 24-year-old went into time trial mode until the finish, where he arrived arms aloft, celebrating win number two of the season, after the one scored on stage 15 of the Giro d’Italia, in Bergamo. It was Quick-Step Floors’ 35th UCI victory since the start of the season, one which ensures our team will go into the Tour de France as the most successful squad of 2017. “We had crosswinds right from the start, and that made up for a tricky race. I went away with a small group, and then, 75 kilometers from the finish line, I attacked and never looked back. I’m happy for this win and for having the chance to sport the colors of my country in the biggest races of the calendar”, explained Bob, who tasted success at the Road Race Nationals for the third consecutive year.